Having seen the 'reformed' WINGER onstage a year ago - read the report here - the depiction was actual. Great instrumentation, faultless performance but lack of that 'party' vibe. The two first albums' clippings were left in the background with the more mature Pull/VI atmosphere ruling the air. Not bad, in any way. This DCD and DVD release (note: they are sold separately!) captures the elements of 2007's WINGER in live action. You choose what's in for you, depending on your IV conclusion remarks. Audio (DCD & DVD): The sound is so sharp you'll actually feel some extra work has been done in the studio. I'd recommend this thought to every other band but I can keep the 'perfection' possibility for WINGER (anyone familiar with Kip's possession in these matters will possibly agree). The setlist is nearly ideal, featuring songs from all their albums, the Morgenstein/Beach 'solo' parts are not exaggerating and Kip's vocals are as as expected by a complete 'pro' he is. As for the playing: you think of WINGER as a 'poser' band? See what musicians have to say bout Reb Beach (DOKKEN, WHITESNAKE) and Rod Morgenstein (DIXIE DREGS) (not to say a single word 'bout Kip's playing/composing skills) and get a 'thinking' life soon. Video (DVD): 10 cameras roll on to capture the event on a 16:9 screen and the video mix is very good indeed. The band is rather conservative onstage, while the audience is as frozen as possible! Cannot get it: you have songs like Seventeen or Can't Get Enough moving on and act like you're attending some cello concert? NTSC region free format is what you get in the DVD issue and Hungry is inserted as a 'DVD only' bonus (while the songlist is rather chopped in regards to the CD discs). 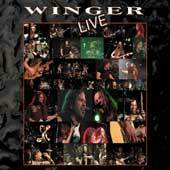 WINGER fans will like this live release (the band's first one). The rest will find no interest, I'm afraid. The quartet shows infatuation, liveliness and a 'jamming' illustration (still, being 100% proefessional) but dunno how many will 'get' this. The rating below is a summary of what's just said.